Press the following button to copy the text for the BOR Letter. Paste it into your letterhead, sign, and return to Avquest using the form on this page. Thank you for being a valued client! This is to confirm the appointment of Shaw Aviation Insurance Service Inc., dba AvQuest Insurance Service as the exclusive Broker of Record and authorized representative for the purposes of developing coverage proposals and placing aviation insurance coverage’s on my behalf. I understand that aviation insurance companies will release a coverage quotation and proposal for insurance to only one broker. By signing this letter, I am terminating the ability of any other broker (including any broker currently involved) to obtain a quotation or to quote / bind aviation insurance on my behalf. I understand however, that Shaw Aviation Insurance Service Inc., dba AvQuest Insurance Service has no responsibility for any deficiencies in the insurance program to which this letter applies until they have had a reasonable opportunity to make a review and to provide us with their recommendations. 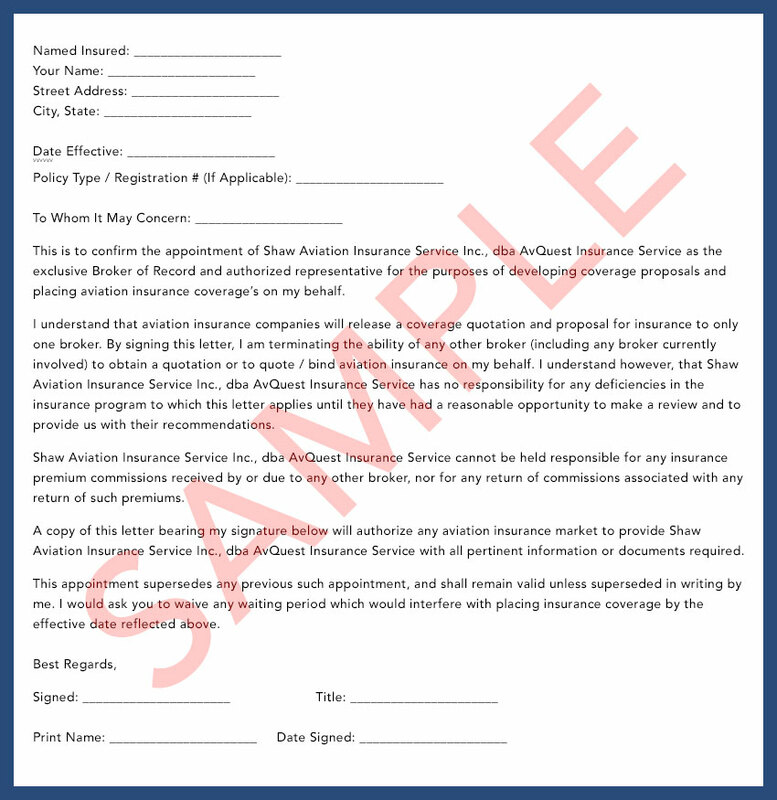 Shaw Aviation Insurance Service Inc., dba AvQuest Insurance Service cannot be held responsible for any insurance premium commissions received by or due to any other broker, nor for any return of commissions associated with any return of such premiums. A copy of this letter bearing my signature below will authorize any aviation insurance market to provide Shaw Aviation Insurance Service Inc., dba AvQuest Insurance Service with all pertinent information or documents required. This appointment supersedes any previous such appointment, and shall remain valid unless superseded in writing by me. I would ask you to waive any waiting period which would interfere with placing insurance coverage by the effective date reflected above.